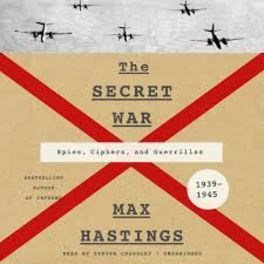 Reading Max Hasting’s excellent book on The Secret War, 1939-1945, I was struck by the parallel between the rise of radio communications in the 1930s and the more recent rise in internet data. The transmission of military and diplomatic messages by radio in the 1930s and 1940s provided intelligence agencies with a new gold mine. Never before had so much potential intelligence been floating in the ether, and yet it threatened to flood their limited manpower with a tide of trivia. The bottleneck was rarely in the interception (trivial with a radio set) or even decryption (made routine by Bletchley Park with the Enigma codes), but rather in filtering down to the tiny number of messages that contained important facts – and getting that information in real time to the commanders in the field. The Ultra programme (Britain’s decryption of German radio intercepts) was perennially understaffed due to the fact that other civil servants couldn’t be told how important it was. At Ultra’s peak in 1943, only around 50% of the 1,500 Luftwaffe messages a day were being processed – and it is unknown how many of those were in time to avert bombing raids. The ‘new age of technology’ in the last two decades poses much the same problem. Data on internet behaviour is abundant: there are countless signals to listen to about your website performance, and the technology to monitor users is commonplace. And the bottleneck is still the same: the filtering of useful signals, and getting those insights to the ‘commanders’ who need them in real time. I started Littledata to solve this modern problem in interpreting website analytics for managers of online businesses. There is no decryption involved, but there is a lot of statistics and data visualisation know-how in making billions of data points appreciable by a company manager. In the world of online commerce, the question is something like whether the client needs insights into the checkout conversion rate of all customers (to improve site design) or for a specific marketing campaign (to improve campaign targeting). So by focusing on insights which are relevant to the scale, stage or sector of the client company, and making these accessible in a real-time dashboard, Littledata can feed into decision making in a way that raw data can never do. Want to discuss this further? Get in touch or comment below!